These are old hiking/backpacking photos from the Southern Los Padres National Forest. I usually carried a camera (Rollei 35T or Nikon FM) in the 1980s. I did not (for the most part) take pictures in the late 1960s or 1970s. In general, the rougher the routes and the more difficult the route finding, the fewer shots I took (a huge mistake, in retrospect). These are scans of Kodachrome and Ektachrome slides and a few Kodacolor prints. I estimate that I have less than 20% of the photos I might have had if I had not lent slides and neglected to retrieve them and if I had been more diligent archiving my photographs. If I find more interesting material I will post it. I find I am more bothered by the loss of some of this record (Lower Sespe, Big Narrows, Madulce Cabin [Madulce has been found], for instance) than the loss of my vinyl LP collection (Beatles, Stones, Hendrix, Creedence, to name a few). Ultimately, I am simply a homesick Los Padres expatriate; in fact, there is an amazing generation of adventure and trail scholarship in process in the Southern Los Padres. I refer the reader to these sites: craigrcarey.net, Ventura County Canyoneering, Jack Elliot's Santa Barbara Adventure and the David Stillman blog. Also peruse the outstanding continuing work to establish the Condor Trail through the Los Padres. 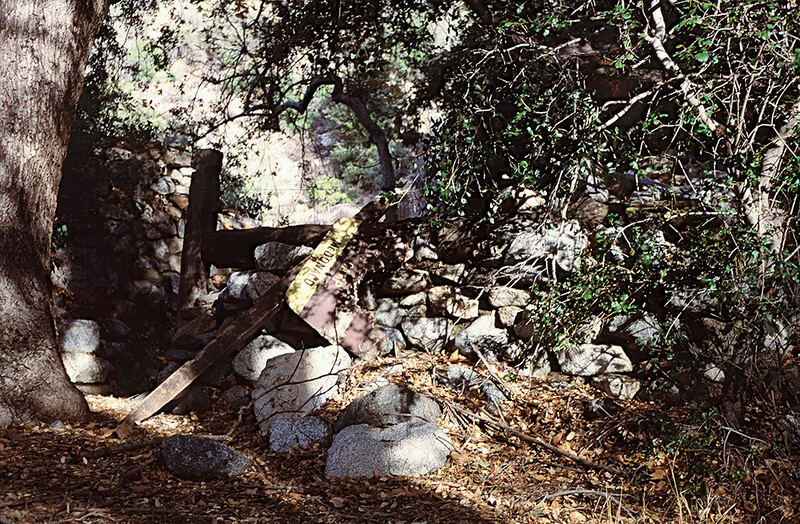 Ruins, McDonald Cabin, 11/1984. I understand there is nothing left of the site in 2010. This is sad, as McDonald was curiously historic. The David Stillman blog describes the area as it is as of 2010.